We were very familiar with YWAM Publishing because we have read many of their books from their Christian Heroes: Then & Now series. Before this review, though, I wasn't aware that they offered the Heroes of History series. I am so glad that I know about it now because there are many more books that I will be buying to supplement our history studies. Unit Study Curriculum Guide for Laura Ingalls Wilder - I received a CD, but they also offer this in a downloadable version. Most of us know about Laura Ingalls Wilder from her Little House on the Prairie books. I also was (actually I still am) a huge fan of the Little House on the Prairie show. In fact, as I was reading this biography, the image in my head of Laura was of Melissa Gilbert. 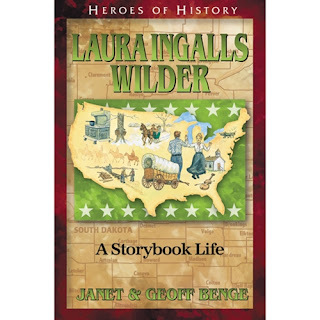 This biography shares pieces of Laura Ingalls Wilder's life from the age of four until her death at age ninety. Both Ballerina and I read the book. The Unit Study Curriculum Guide is a wonderful addition to the book. One of my favorite parts of the guide is the Homeschool Overview Guide. It contains a chart listing the Heroes of History biographies along with the time periods each of them cover, Social Studies concepts emphasized in the book, and other topics that would go along with each book. It also has a curriculum timeline that breaks down which books to read to complete a fairly comprehensive study of American history over either one or two years. An additional aspect of the Homeschool Overview Guide is a breakdown for how to use each section of the unit study for parent-directed or student-directed study. Hands-on projects - Some of the projects include making butter, making a sunbonnet out of calico, growing root vegetables, and making a relief map. There are so many activities available that you could easily spend the better part of a year just on this book. Of course, I suggest just picking and choosing the ones that work best for your family, and then being able to delve into more of the books from the Heroes of History series. The book was good. It included some things that aren't in the Little House books.